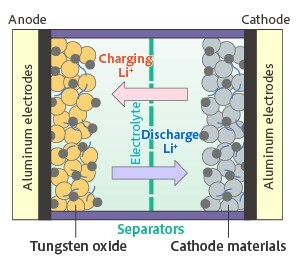 Toshiba Materials is developing tungsten oxide powder as an electrode material for new battery devices. The electron conductivity and lithium ion diffusion of tungsten oxide powder can be improved to achieve ultra-fast charging and discharging. This material makes it possible to build battery devices with high power density, which will enable smaller and lighter devices in areas such as energy regeneration and large current sources. 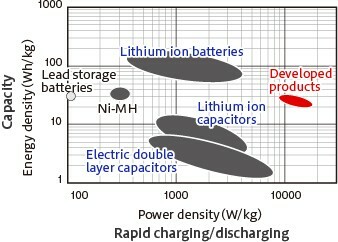 Fine powder several μm in size, enabling use in lithium ion battery electrodes. 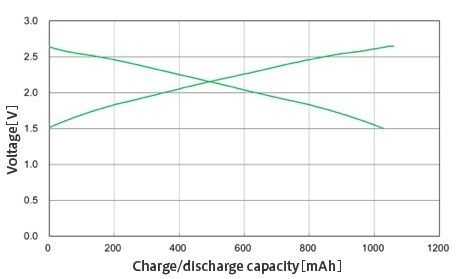 Much greater capacity (energy density) and charge/discharge speed (power density) than conventional electric double layer capacitors.